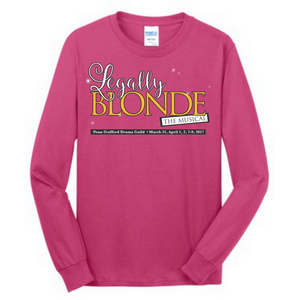 "Legally Blonde” T-shirts & others can now be ordered through the link listed below. 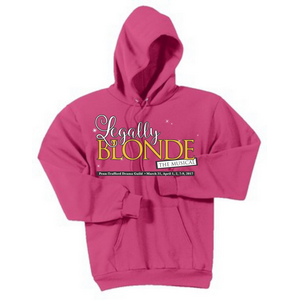 You can order T-shirts, Long-sleeved T-shirts, Sweatshirts and Hooded Sweatshirts. Anyone can purchase these! Please note that after the deadline of Friday, March 10th at 5:00pm...there will be no additional orders after this date. They must be ordered before 3/10 at 5pm. Please know that the kids wear these shirts to advertise the show on certain days and also when we go to visit the elementary schools. Please be sure to order one if your student wants to wear them in the future too! Some do not realize that the kids who are in the shows wear them every year leading up to the current show. 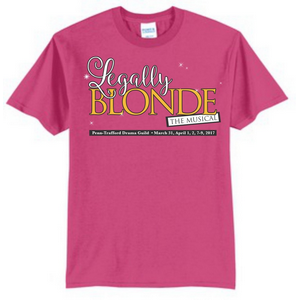 For an example… Seniors who were in "Shrek" will wear their shirt on the Tuesday leading up to Opening Night...then any kids that were in "The Music Man" will wear their shirts on Wednesday...then any kids who were in "Once Upon A Mattress" will wear them on Thursday. 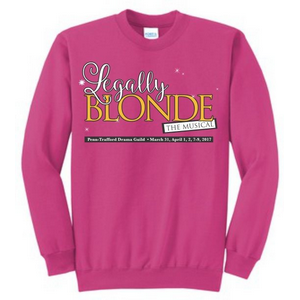 Then on Friday, everyone will wear their "Legally Blonde" shirts! ALL ORDERS MUST BE RECEIVED BY MARCH 10, 2017 AT 5 PM. NO EXCEPTIONS. ALL ORDERS MUST INCLUDE A VALID CREDIT CARD AND COMPLETE ALL PAYMENT FIELDS. PLEASE PROVIDE THE ADDRESS THAT THE CREDIT CARD IS BILLED TO FOR CARD PROCESSING. ALL CHARGES FOR THIS STORE WILL BE PROCESSED THROUGH: PREMIER PROMOTIONAL SOLUTIONS.